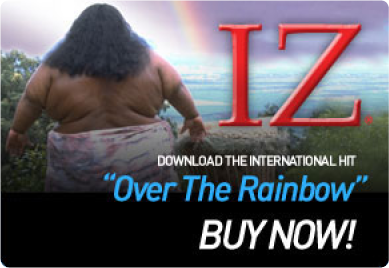 Get a Free Download from IZ. We wanted, to thank you fans for all of your support we also wanted to offer you a free download of “Hawaii ’78” which you can get in the sharable widget below. There are 436 comments on Get a Free Download from IZ. God works thru people,and their music, to enrich our lives and remind us that someday we will all meet once again, somewhere over the rainbow~ This I know! Just LOVE this song by IZ and cannot seem to get it off my head. He is deeply missed. I remember when my family lived in Honolulu, Hawaii because my dad was stationed there in the Navy back in the early 1990’s for his last 3 years of his 21 years of service, and the only music we ever listened to was Hawaii 78, Wonderful World, and Over the Rainbow, and after hearing those songs again for the first time in almost 20 years i cant help but cry, it just brings out so much emotions and memories that i had forgotten about, these songs just make me feel like a human being again and i cant even explain how thankful i am for that. My daughter passed away November 13 2011, still waiting on cause of death for a 33 year old woman. She left behind 2 sons, 3 & 6, but I remember her playing this song so much, she even asked her husband to get her a ukulele, so she could learn to play the song. She never got the chance to learn the song. Música como esta, es una joya, solo basta cerrar los ojos puedes viajar a los más hermosos momentos de la vida, sentir el calor de un amor que es eterno. love his voice and seeing that he was a happy man, i saw the love from the people that loved him too. Somewhere over the rainbow, cool beans, and excelent! This is the Best Version Ever! So sad I wasnot born in Hawaii! So sorry to hear of his passing. I think the world lost a beautiful soul! He will be missed by so many and was loved by so many! I feel blessed to have gotten to hear his songs! I have been wanting to know how can I get this song.Thank you very much for the gadget that we have now… Again Thanks and GOD BLESS. love this song..makes me want to go back to Hawaii! fantastic!!! it’s so wonderful!!!! u really rock!!! Thanks and GOD BLESS. you IZ . I have listened to your music before but did not know where to find it to purchase it. This song was very enjoyable. My wife and I thank you for this wonderful gift and hope to purchase more of your music soon. Me encanta esta cancion, pienso en suenos que tenia de nina y en el futuro que Dios nos promete donde todo sera felicidad y no habra mas muerte, in enfermedad ni tristesa, ni guerras ni hambre. Donde habra un gran arcoiris, el que Dios le prometio a Noe despues del dilubio. Tambien nosotros estaremos juntos con nuestros seres queridos que fallecieron y estan durmiendo en la tumba. Oh que Dia mas glorioso sera ese al otro lado del arcoiris con Dios. Every once in a while a great spirit comes across with a melody that lifts the world up a few more inches off the ground. and the rainbow and for that we are grateful as our dreams don’t end in this world. Spiritually satisfying. Thanks for the download. My mothers funeral is two days from now, as I was putting together a CD with pictures of her to play at the showings. I came across your song. I could not stop crying as I listened. Thank you for such a beautiful approach to this old song. This is the most soulful video i have ever seen – thankyou so much for sharing it. “Somewhere over the Rainbow ” – todo vez que ouça esta canção me recordo da minha infância e me emociono muito, simplesmente é incrivel o que uma musica pode fazer conosco fico muito feliz em poder ouvir sempre esta musica que para mim é inequecivel. Very beautiful song, will be listening to all the Hawaii Songs soon, in the near future. Mauru’uru ia oe e ta’u bruddah no te reo himene to oe tai fa’ana’anatae i to mafatou. Great thanks my bruddah for your voice that makes my heart so happy. Aroha ia rahi o oe tei paruru mai i toe nuna’a, te nuna’a no te patitifa. Such a beautiful but emotional version of the rainbow song! I heard this version at my brother’s funeral last year June month and I have downloaded it on my mobile and use it for my ringtone! BUT MORE HEART WRENCHING WHEN I SAW THE MUSIC CLIP REMINDED ME OF MY LATE BROTHER COS HE WAS VERY MUCH LIKE IZ…A LOVER OF MUSIC:-) I WILL ALWAYS CHERISH THIS VERSION!!! THANK GOD FOR THE LIFE OF OUR STRONG CULTURAL-MINDED BROTHERS!!! He brought a smile to my face and a tear to my eye,,,,, may you rest in Peace. I love the song “Over the rainbow” ! It makes you want to keep fighting despite all the troubles of life ! I dedicate “Over the rainbow” to my parents who passed away in 2009 in very tragic circunstances because I know they are there, over the rainbow, taking care of all of us. Beautiful song, really, thank you. Just pure relaxing and touching music, Mr. IZ is still here in our heart and ears and spirits in 2012 ! Best of luck and wishes to everyone! The only one that could sing this music was Israel IZ. I am looking to purchase the instrumental of Somewhere over the rainbow. Do you have that option or can someone help me out?